Biography of Dutch Still Life Painter of Amsterdam School. 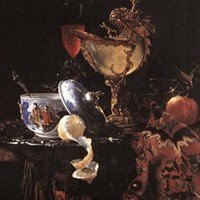 The Dutch still-life painter Willem Kalf was one of the Old Masters of the Amsterdam school of Dutch Realism who specialised in luxurious banquet sets known as Pronkstilleven - a species of still life painting, which contained gold, silver and glass vessels. The brilliance of his colours suggests the influence of Jan Vermeer (1632-75). Like many still-lifes from this era, including those by his contemporary Jan Davidsz de Heem (1606-83), Kalf's paintings belonged to the genre known as vanitas painting, but in general it can be said that Kalf preferred to paint art for the sake of art, albeit in keeping with the new aesthetics of Protestant Reformation art. He spent a lifetime improving his craft, in a never ending quest to present beauty on canvas. Towards the end of his career, he also became a dealer and appraiser of fine art painting. 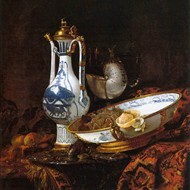 His best known works include Still-Life with a Nautilus Cup (1662). He remains one of the great Dutch Realist artists of the 17th century. please see: Dutch Painting of the 17th Century (1600-80). Kalf was born in Rotterdam in 1619, his father was a wealthy cloth merchant. Little is known of his early life, but it is suggested that Kalf was influenced by Frans Rijckhals (1600-47) a local artist who was known for his small peasant scenes which included still-lifes of fruit and vegetables. Following the death of his mother, Kalf moved to Paris in 1641, an important centre of Baroque art, where many of the Flemish artists of the day were gathering. There are few records of his early artistic training, but it may be that he received some sort of lessons in Paris. Kalf's early paintings were primarily small-scale rustic scenes of interiors and a few still-lifes (eg. Kitchen Still-life, Gemaldegal, Dresden). Even in his interiors, Kalf's passion for still life is apparent, as he usually arranged a still-life in the foreground on tables or on floors, while his figures were blurred in the background. Although many of his paintings are not dated, or the date has since worn off, it is thought he may have painted his largest picture Still Life with Armour (over 6 feet high) while in Paris. In 1651 Kalf returned to Holland and settled in Amsterdam in 1653. Still life painting as an independent genre first flourished in Netherlands in the early 1600s, although French and German painters like Sebastien Stoskopff (1597-1657) and George Flegal (1566-1638) were early contributors to the movement. Although technically still-life motifs occurred in religious art and illuminated manuscripts, it was not until the 17th century that it was appreciated as an individual art form. Still-life became endowed with moral messages through vanitas works, including those by Jacques de Gheyn (1565-1629), Harmen van Steenwyck (1612-56) and Abraham van Beyeren (1620-90). Vanitas paintings used props like skulls, peeling lemons and rotting fruit to depict the fleetingness of life. Still-Life with a Nautilus Cup (1662, Museo Thyssen-Bornemisza, Madrid) is an example by Kalf which places a peeled lemon at the centre of his still life composition. The rise of still-life in Northern Europe (primarily centred in Antwerp, Leiden, Middelburg, Haarlem and Leiden) was prompted by the establishment of a growing middle class, who increasingly had money to spend on items such as oil painting. While flower painting became associated with Antwerp and The Hague (Jan Brueghel the Elder 1568-1625, being a main proponent), monochrome banquet still lifes became the speciality of Leiden artists like David Bailly (1576-1624) and Jan Davidsz de Heem. Amsterdam meantime, was becoming a city packed with wealthy merchants, and those merchants wanted ostentatious displays of their wealth. Kalf and van Beyeren became the most important practitioners in the luxurious painting market, producing highly realistic Pronkstilleven (display) still-lifes. They painted still lifes with imported exotic fruit, expensive Turkish carpets, Chinese porcelain and silver and gold vessels, depicted in a glistening, velvety atmosphere. Two examples by Kalf include: Still-Life (1653, The Hermitage, St Petersburg) and Still-Life with an Aquamanile, Fruit and a Nautilus Cup (1660, Museo Thyssen-Bornemisza, Madrid). His use of colour has echoes of Rembrandt's chiaroscuro technique and Jan Vermeer's colour scales and Pointille technique. Pointille is a decorative technique whereby patterns are formed on the surface of paint by means of punched dots. It is similar to engraving or embossing, but is manually carried out and does not cut into the surface, rather just dents it. Originally Pointille was used to decorate arms, then fine art painters started using it to render metal and fruit surfaces more realistically. Kalf became financially successful in his lifetime becoming one of the most sought after exponents of still life and Dutch Realist genre painting. He established a large studio, and when a particular painting composition became popular, it would be copied and reproduced numerous times by his pupils. After the 1680s he appears to have set his paint brush aside, in order to focus on buying and selling artworks. He died in Amsterdam in 1693. NOTE: For the leading exponents of the vanitas genre known as "breakfast pieces" (ontbijt or ontbijtjes), which criticized human gluttony and sensual indulgence, see: Willem Claesz Heda (1594-1680) and Pieter Claesz (1597-1660). By the 18th century, the Dutch Golden Age of painting was over and Dutch still-lifes could hardly be distinguished from similar works by Flemish, German and French artists. Indeed, it is the French painters Jean-Baptiste Oudry and Jean Chardin who are considered to be the 18th century heirs of the Dutch still-life tradition. By the 19th century Kalf's pictures were largely forgotten, but when many were restored in the 20th century, his skill was compared favourably to Vermeer and Rembrandt and he became recognized as one of the best still life painters of his age. It's worth remembering that still-life was traditional considered the poor relation of genres like portraiture or history painting, because - supposedly - still life could not be infused with any deep moral or ethical message. However, not only did Kalf (and others) succeed in imbuing their still lifes with considerable morality, but his devotion to the genre showed that beauty alone could suffice - a lesson which would become one of the foundations of modern art. Still life paintings by Willem Kalf can be seen in many of the best art museums throughout Europe.  For biographies of celebrated European artists, see: Old Masters.